Allday Consulting is an Authorized Reseller and have been selling and supporting Sage 50 Peachtree since 1985. If you manage multiple companies and budgets or need better insight into your numbers for strategic planning, then Sage 50 Peachtree Premium Accounting is for you. It includes all of the features in Sage 50 Peachtree Complete Accounting, plus advanced filtering on financial statements, progress billing, serialized inventory, and employee compensation tracking. 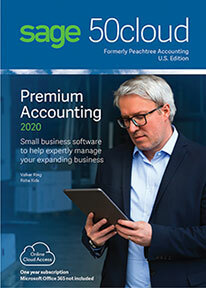 Sage 50 Peachtree Premium Accounting system helps with your day-to-day accounting as well as your business management and strategic planning. Easier to use than ever, it gives you the accuracy and control you need to improve results.